Geoffrey A. Moore book Dealing with Darwin: How Great Companies Innovate at Every Phase of Their Evolution lists several different types of innovations. 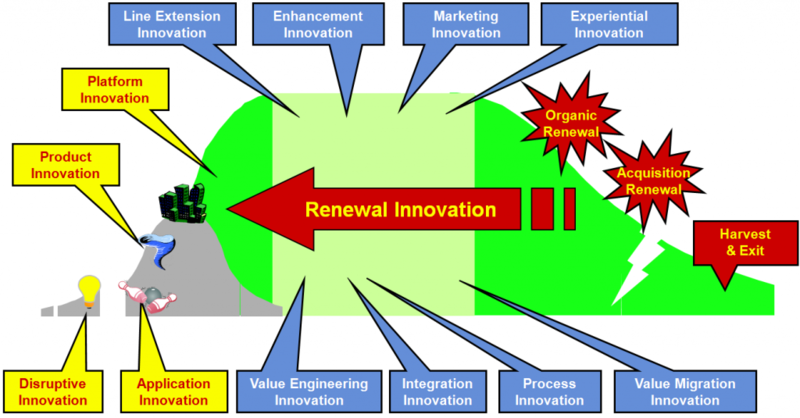 These innovation types can be used in the different stages of a company evolution. It is a very good book, however you can see that the author is a consultant, to read the book and understand the jargon you have to be either a consultant or have a MBA. With a different business model, Google is entering and disrupting different industries by giving away software and services for FREE. In those industries, competition was traditional, based on features and price. But now, you can have the same features, sometimes even more, and all come for free. Just few examples: Google Android is open source and FREE. Google Map Navigation (turn by turn navigation) is now FREE and offered (at the moment) for Android 2.0 devices and in USA. Of course, this is not really FREE, money will come from other channels, in this case from advertising. But how do compete in these cases? How should “traditional” companies react? Coming from a different industry and with a different business model is quite disruptive from the incumbents. I do not have the answer to those questions. Certainly, companies must now offer a significant reason to pay for their products and services. For most people a good-enough-offer for FREE is just fine. Companies should also be creative and maybe take some ideas from Free of Chris Anderson. See the previous posts on Free!, Monetization in the Internet, excellent survey on the most popular business models. and Built to Last: Successful Habits of Visionary Companies. In this book Collins addresses the questions: How do the mighty fall? Can decline be detected early and avoided? How far can a company fall before the path toward doom becomes inevitable and unshakable? How can companies reverse course? Never give in. Be willing to change tactics, but never give up your core purpose. Be willing to kill failed ideas, even to shutter big operations you have been in for a long time, but never give up on the idea of building a great company. Be willing to embrace the inevitability of creative destruction, but never give up on the discipline to create your own future. Be willing to embrace loss, to endure pain, to temporarily lose freedoms, but never give up faith in the ability to prevail. Be willing to form alliances with former adversaries, to accept necessary compromise, but never – ever – give up on your core values. The path out of darkness begin with those exasperatingly persistent individuals who are constitutionally incapable of capitulation. It’s one thing to suffer a staggering defeat – as will likely happen to every enduring business and social enterprise at some point in history – and entirely another to give up on the values and aspirations that make the protracted struggle worthwhile. Failure is not so much a physical state as a state of mind; success is falling down, and getting up one more time, without end. I have recently attended a talk by Chris Messina where he pointed out some interesting issues with the existing social networks. We invest a lot of time on them, we establish a network of friends, exchange ideas, share photos, videos and comments. What happens when that social network ceases to exist? Who owns the data? Why I cannot export my data and bring them to another social network? We lack standards and the willingness of social networks to let us easily switch from one to another. Chris is trying to address those problems and is spreading his vision. Identity is the Platform from Chris Messina on Vimeo. and one related and interesting presentation by Jyri Engeström co-founder of Jaiku, which was acquired by Google in 2007. If you wondered about the scope and meaning in an organization of portfolio management the book Portfolio Management for New Products by Robert G. Cooper, Scott Edgett and Elko J. Kleinschmidt brings some good information about its meaning and explains several techniques used in the industry to improve this process. Portfolio management for new products is a dynamic decision process wherein the list of active products and R&D projects is constantly revised…. It is more than project selection, although that is part of it; it is certainly much more than annual budgeting or resource allocation across projects; it goes beyond simply developing a prioritized list of projects; it is more than strategizing and trying to arrive at the best set of projects to meet strategic needs, although strategy and strategic imperatives are certainly key components. Balance in the portfolio: Portfolios can be balanced on numerous dimensions. The most popular are risk versus rewards, ease versus attractiveness, and according to breakdowns by project types, market, and product lines, long-term vs. short terms, high risk vs. low risk. Link to strategy: Strategic alignment- strategic fit, project selection, and resource allocation reflecting the business’ strategy – are the issues here. When looking for disruptive innovation it is useful to target nonconsumers. Nonconsumers are people that due to certain contrainsts are not able to “consume”. From the Innovator’s Guide to Growth: Putting Disruptive Innovation to Work (Harvard Business School Press) we get the following suggestions. skill-related contraints: People lack the requisite ability to “do it themselves.” Mapping the delivery chain of a product or service can highlight skill-related constraints. wealth-related constraints: People can’t afford desirable solutions. A consumption pyramid can help identify wealth-related problems. Access-related constraints: A barrier prevents consumption in convenient settings. Looking for “locked up” solutions or occasions where consumptions can’t occur can help unearth access-related constraints. Time-related constraints: The complexity of existing solutions, or length of time required to use them makes the investments not worthwhile. Analyze customers who stopped consumptions can pinpoint time-related constraints. from Matt Cutts blog post BusinessWeek articles on Google. What are you doing to expose yourself to new challenges? How can you get closer to the “action” in your field or organization? What can you do to get closer to transformational efforts in your company? It interesting to see how Asia is growing in its strategic importance. Scott is moving to Singapore, and recently HSBC decided to move the CEO to Hong Kong.